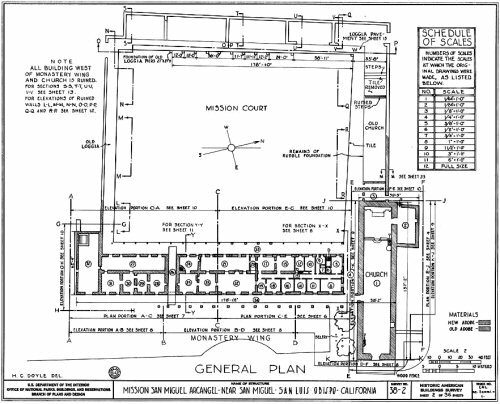 Mission solar illumination - the builders and designers of the California Mission churches sited and oriented them in according to a sacred geometry that enabled the sun to shine on certain statues and images on particular holy days. 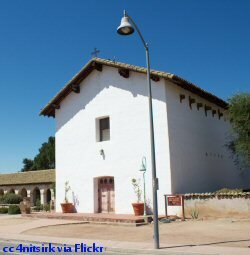 If someone visits one or more of the California Missions, it could be easy for them to come away with the sense that in spite of the lovely Mediterranean inspired architecture, they are essentially just simple clay buildings. That misconception is not the case. For many years there has been an appreciation of the building's form and how they made living in a hot and dry climate tolerable. Thick walls, fountains, inner courtyards and shaded colonnades all contribute to that end. Recently, there is another aspect of the siting and construction of the missions which has been rediscovered. That is, the solar geometry of the buildings. What this means is that the churches of the missions were oriented in such a way that the sun would shine through the windows or door and illuminate the tabernacle, a statue or a painting on a specific date, usually the holy day or feast day of the saint illumined. This discovery is the work of Dr. Ruben G. Mendoza, a professor of archaeology at Cal State University at Monterey Bay. 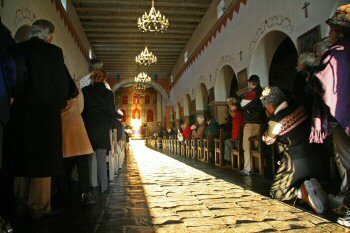 Dr. Mendoza initially noticed this phenomenon at the Mission San Juan Bautista where the first morning light shines directly on the tabernacle on the altar on the winter solstice. 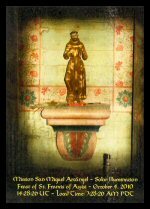 He and his students have documented illuminations at 60 churches throughout the Americas and at 14 churches in California. Is this just happenstance or chance? Most likely not, since the Franciscan friars had access to the 10 Books on Architecture by the Roman Vitruvius, an inspiration to builders for 2000 years. Additionally, Catholic Church documents have been found which stipulates this particular orientation. What Dr. Mendoza has found in his Mission Solstice Survey is that "Mission San Miguel has the most complex array of solar geometries anywhere in the Americas". 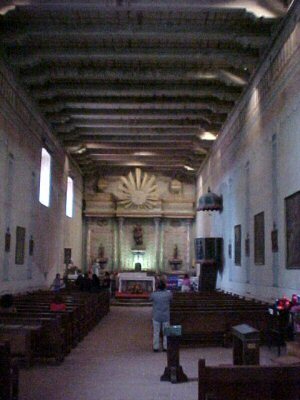 The front of the church at Mission San Miguel. The sun enters through the window above the door for the illumination. Working with Dr. Mendoza, John Warren, the curator at Mission San Miguel, has found that there is a series of illuminations of the reredos behind the main altar spanning a number of days including September 29. That date is the feast of the Mission's patron, Saint Michael the Archangel. The illuminations continue through October 4, the feast of Saint Francis of Assisi, the founder of the Franciscan religious order and continues for several more days. There are other days when illuminations occur, and certainly not all have been discovered and documented. An illumination was re-discovered at a mission in San Antonio, Texas recently. It had been overlooked since it took place later in the day when the church was usually closed. I was present at the Mission San Miguel yesterday morning, October 4, but unfortunately the Salinas River valley was enveloped with fog and no illumination occurred. Another factor is that some of the mission churches aren't original. Some are reconstructions, and while they may have been built on the foundations of the earlier church, the siting of doors and windows may no longer be the same. I expect that as illuminations at the missions are re-discovered, it will be more common that the events will be publicized and become better known. Mission San Juan Bautista - Winter Solstice illumination.